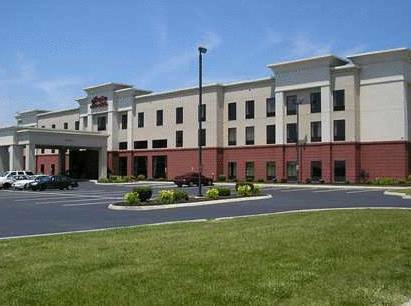 This hotel is 100PCT Non-Smoking The Hampton Inn - Suites Springboro/Dayton Area South hotel is a 3 story hotel conveniently located off Interstate 75 between Dayton and Cincinnati Ohio. The Hampton Inn - Suites hotel is located close to all Springboro and Franklin business parks as well as many other area corporations. Local points of interest nearby this Springboro Ohio hotel include La Comedian Dinner Theater Forefinger*s Chocolate Factory Springboro Historic District - Underground Railroad tours Waynesville Antiques Leatherwood Golf Club shopping flea markets and much more. In Springboro Ohio the month of May brings us the Freedom Festival August through October weekends has the Renaissance Festival in October the Sauerkraut Festival and then finally in November brings us the Christmas in Historic Springboro Festival. The Hampton Inn - Suites Springboro/Dayton Area South Ohio features standard rooms as well as studio suites and whirlpool rooms. All rooms at this Springboro Ohio Hampton Inn - Suites hotel feature high-speed internet and cordless phones. The hotel offers a meeting room that can accommodate up to 100 people an indoor heated pool outdoor patio business center guest laundry and suite shop. An onsite fitness center is also available to our guests. The Hampton Inn - Suites hotel is centrally located between many Dayton and Cincinnati area attractions including Paramount*s Kings Island The Beach waterpark Cincinnati Zoo - Botanical Gardens Newport Aquarium and Newport on the Levee Golden Lamb /oldest restaurant in Ohio/ Cincinnati Reds baseball/Bengals football Wright Patterson Air Force Base - Museum Dayton Dragon baseball/Bombers hockey and many more. We love having you here at the Hampton Inn - Suites in Springboro Ohio. All reservations must be cancelled by 11:59 host time the night before arrival unless a deposit is required. If this reservation was made electronically please cancel it electronically to avoid confusion and a no show bill. Policy is subject to change. - Dayton Daily News Print Tech.